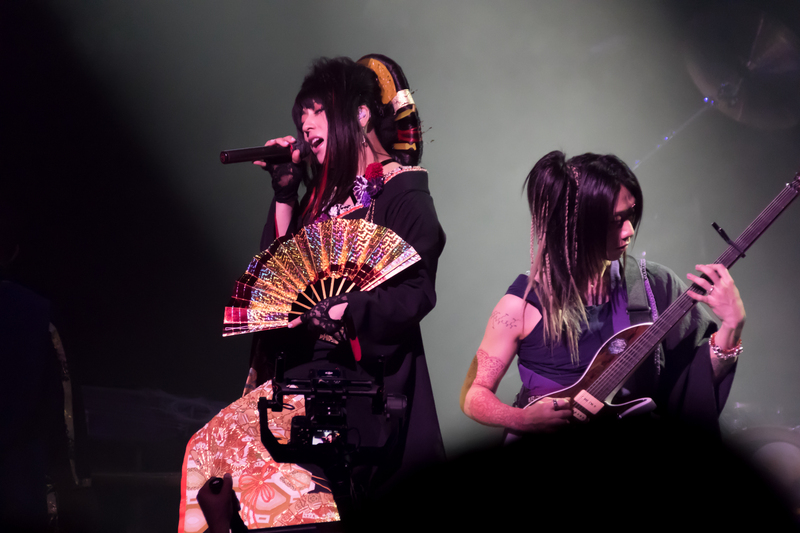 Fans gathered at Club Nokia on a hot July 4 afternoon to watch both IA and Wagakki Band perform at the Cool Japan Festival presented by Anime Expo. 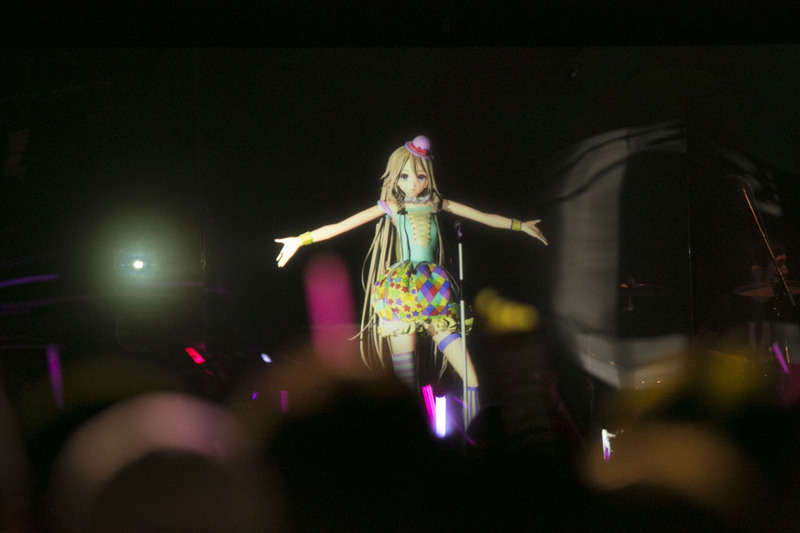 IA appeared in many different outfits on a transparent projection screen as she sang nine songs, joined by a live band as well as two dancers. 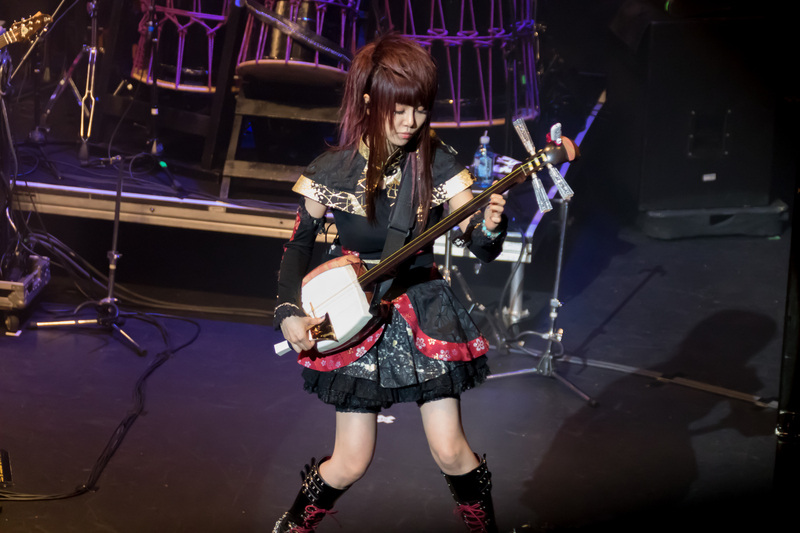 Her performance was followed by an energetic show from Wagakki Band as they rocked out to both VOCALOID cover songs (e.g. from Vocalo Zanmai) and their new originals. We’ve compiled a detailed play-by-play of the concert for this live report, and we would like to thank Cool Japan as well as Beautiful Day Media for giving us an opportunity to cover this event. 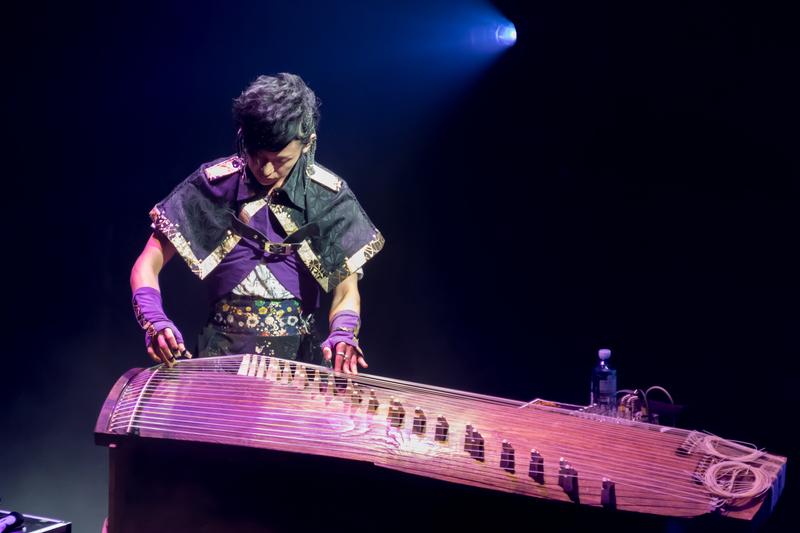 Unlike some of the other concerts held as part of Anime Expo this year, the Cool Japan Festival did not suffer from delays in ticket redemption. Tickets were divided into five categories—pit, floor and balcony, along with VIP versions of pit and balcony. Pit and floor were standing only, and VIP tickets allowed early entry and access to meet and greet sessions for IA (pit) and Wagakki Band (balcony). Each type of ticket was exchanged for colored wrist bands to allow entry into Club Nokia, e.g. VIP pit had silver wristbands whereas VIP balcony had gold ones. While ticketing had no big hiccups, entry and the start of the concert was delayed by roughly one hour. Rumors were that there was some miscommunication with Club Nokia on the total expected attendance and entry procedures had to be revised before seating could properly begin. After passing through bag check and metal detectors, fans also had the chance to purchase merchandise in a small booth located to the left of the entry doors into the club proper. As more and more people started filing in, the pit area got more and more crowded, and there was a big throng of people piled up against the front railing of the floor section as well. Some of the staff started passing out the thin pink glow sticks they were selling at the booth to people at the front of the pit. Finally, the lights fully dimmed, and fans erupted in cheers as the projection screen lit up. The concert started with a video, showing a bright comet-looking object making its way through the solar system on the way to Earth. It then zoomed in to California and then finally to Los Angeles, ending with a shot of feathers coalescing into IA in an angel outfit. After the glow faded, she immediately launched her set with Inner Arts. As the drums kicked in, the crowd followed along, chanting in rhythm while waving their pink (and white) glowsticks. As the song finished, IA disappeared in a double helix lighting effect, appearing soon after with a loose ponytail and in a short lemon yellow dress over shorts. She was joined by the dancers as she performed the more laid-back Circuit DISCO. Hello everyone, nice to meet you, my name is IA! Thank you for coming to see my concert today. Please enjoy yourselves all the way to the last minute! Now it’s time for the next song, We gotta run. Everyone, please join me in rocking this house! Her speaking voice sounded a lot more natural than typical renderings using the VOCALOID engine, sounding somewhat similar to Miss Monochrome’s voice. There was also a rather long gap between sentences, as if to leave room for the audience to respond. With her MC done, the synth intro for We gotta run started up and IA started singing again, this time in an outfit similar to the one from the original PV. This song was quite a crowd pleaser, with the audience singing together with IA during the chorus as well as chanting, jumping and waving their hands. Although the original song was an electric tune, the live band performed an arrangement with guitar, drums and piano thrown in. What followed were the drum and bass number SEE THE LIGHTS and the hard hitting synthpop tune Shooting Star, both suitably arranged for the band. The former saw IA’s outfit strobing to the music, and the latter had IA drawing a big heart with her hands whenever she sang “One Love” in the chorus. Thank you. And that was Jin’s Children Record and Outer Science from Kagerou Project. Is everyone having fu~n? [I’m] also enjoying it a lot! I really want to continue singing forever, just like this, but the next song will be the last song. Everyone on stage and everyone out there, are you ready? Please sing this together with me: America! ~We are all right~! Thank you very much for coming today. It was totally awesome. I will never forget this concert today that we all helped create together. Let’s go! With the speech concluded, IA and the band kicked into the final chorus of the song before exiting. Thank you very much everyone for today! It was so fun that time flew by in such a hurry. Now it’s finally time for the very last song. Looking forward to being with everyone like this again, I will continue singing so please cheer me on. So here’s the last song, which I’ll sing to you with all my energy. Please have a listen to … Otsukimi Recital! I was so happy and excited to meet you. Lots of love from IA. A final message from IA to her fans. After the intermission, it was Wagakki Band’s turn. Traditional Japanese music played in the background as the members of Wagakki Band filed in. 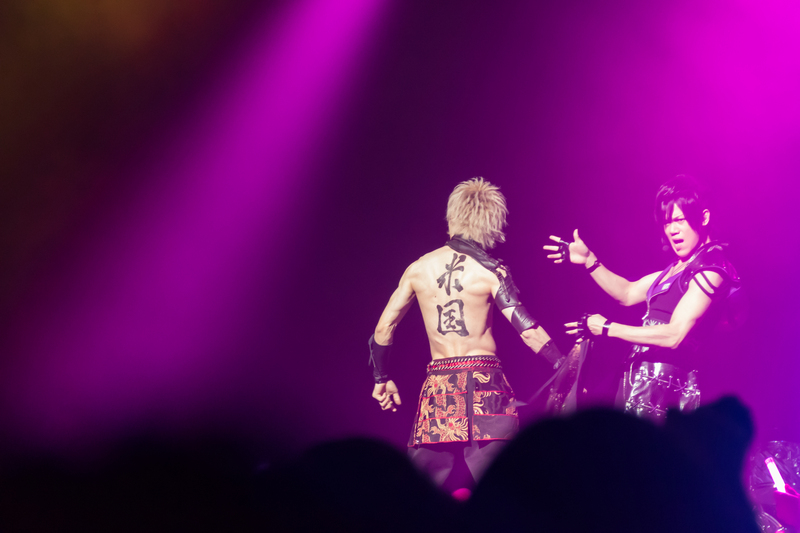 First were Wasabi (drums) and Kurona (wadaiko); they walked up to the front of the stage, and Kurona removed the top of Wasabi’s outfit to reveal the painted characters 米国 (America) on his back. 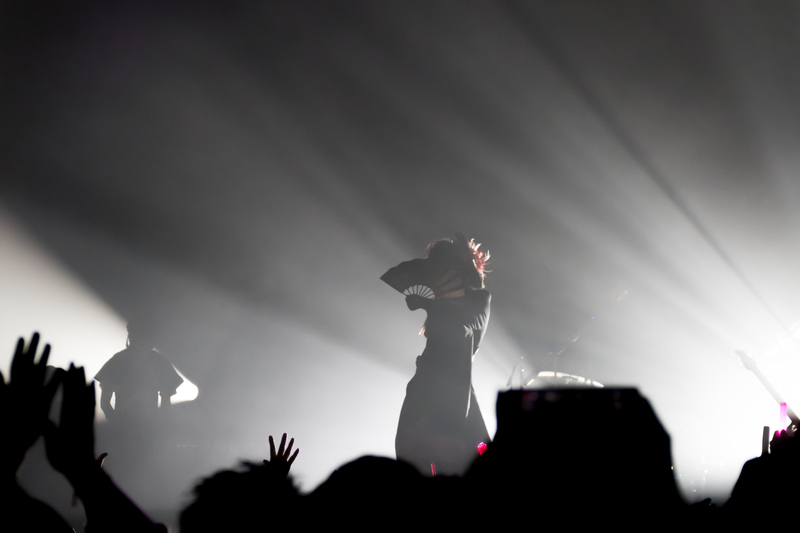 Afterwards, the rest of the band appeared, waved to the audience and walked to their positions, with the last being Yuko, who entered while dancing with her fan. Then Yuko paused, the drums rolled, building up the tension, and the first song began. It was no surprise that they started with their cover of Senbonzakura, as it was by far their most popular cover with over 22 million hits on Youtube. The next two songs were also covers of VOCALOID songs: Iroha Uta and Yoshiwara Lament. Yoshiwara Lament was composed by the bassist Asa, who’s also a well-known VocaloP/UtauP. Unlike most songs where Machiya provides the backing vocals, Asa sang alongside Yuko for this song. The next song, a cover of Kagerou Days, was undoubtedly a fan-favorite, considering that the crowd was full of Kagerou Project fans who came to see IA. 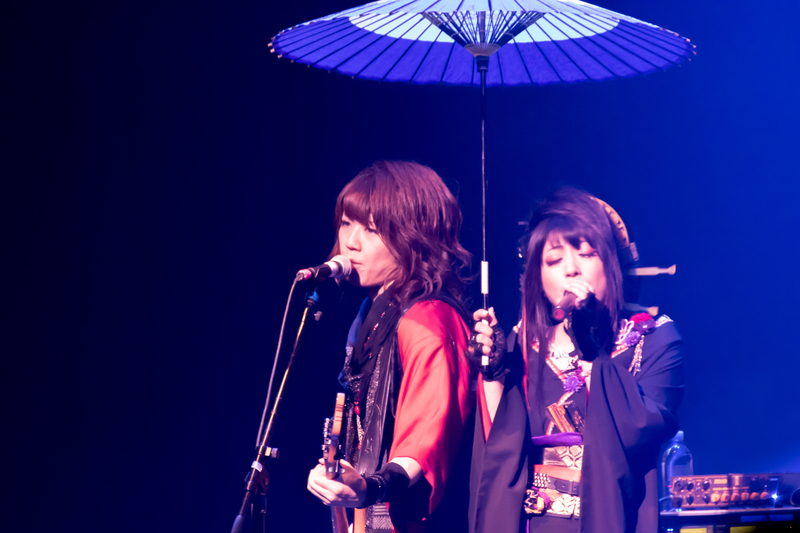 It was followed by a cover of Tengaku, yet another VOCALOID song Wagakki Band is well-known for covering. 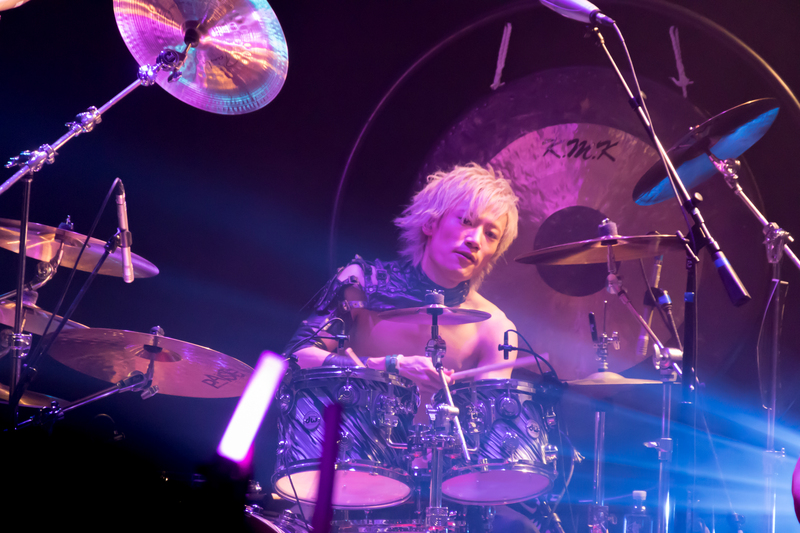 After Tengaku came a segment called “Drums x Wadaiko”—a drum battle between Wasabi and Kurona. It consisted of Kurona and Wasabi taking turns showing off drum solos. Kurona added his characteristic chants and shouts to his, while Wasabi showed off his rapid fire drumming. Together they asked the crowd to participate in the shouts/cheers. At their command, the crowd yelled “Wa! Gakki! Band!” in unison. The segment ended with the two having a final jam session complete with light-up drumsticks. Machiya then appeared on stage and started playing the Star-Spangled Banner on his guitar, appropriate given that the concert took play on Independence Day. The audience was a bit stunned at the familiar song, but they started singing shortly thereafter. Machiya then dove into a guitar instrumental song with the percussionists. The song—Homura—is an original song composed by Machiya himself for his own self-produced single of the same name. Asa joined in and blended in Yoshiwara Lament. Beni joined in as well with her shaminsen and the three played together. 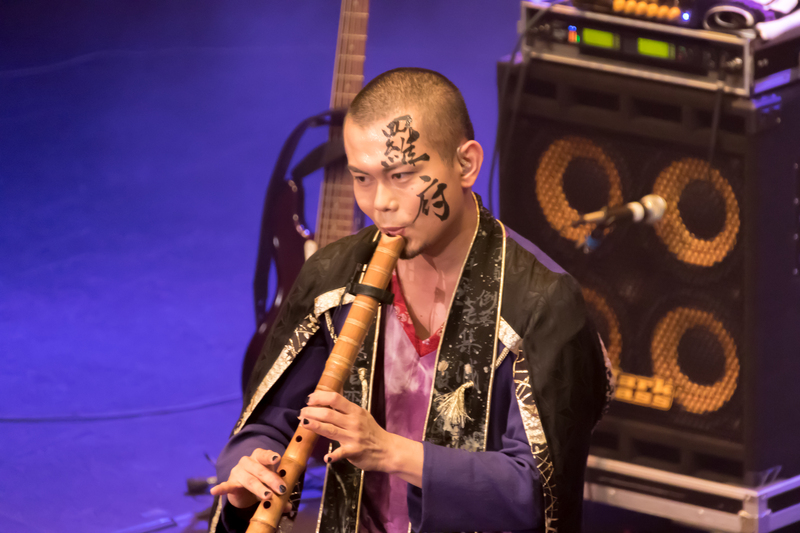 Up next was Akatsuki no Ito, an original song from their upcoming album Yasou Emaki. Unlike their cover songs, this original song contains more traditional Japanese style singing. The intro started with traditional shigen and then transitioned into an intense guitar solo. Following Akatsuki no Ito was a surprise treat: Children’s Record. This song is not on any of their albums and they only perform it during concerts. This song featured both Yuko and Machiya as main vocalists. Machiya is no stranger to singing as he sings for his own band m:a.ture. After Children’s Record, there was an MC segment. Yuko asked the crowd if they were having fun and mentioned that she was indeed having fun. She said she was surprised at the number of people who spoke good Japanese and told the audience “I hope you feel Japan through our music,” thanking everyone. Finishing up the segment, she introduced the next song: Ikusa. Machiya got the crowded pumped up by yelling “What’s up! ?” and playing his guitar several times before starting the song. Ikusa is the theme song of Sengoku Musou, an animated TV series which aired in Japan earlier this year. During this song, Asa’s bass lit up with embedded neon lights. Following Ikusa was Hanafurumai, another new original song, which is avaliable as a digital single on iTunes. Interestingly, this is a collaboration song for a Pachinko machine. 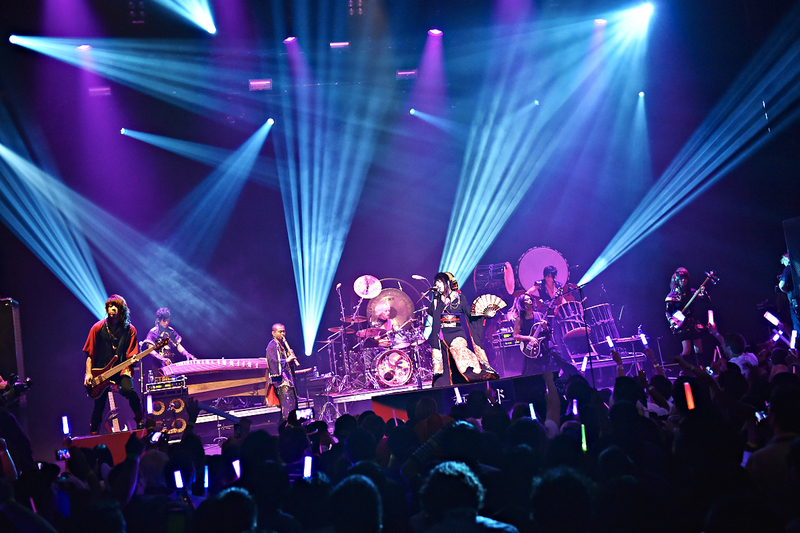 Wagakki Band then continued with a cover with Setsuna Trip. As they exited the stage, chants of “En-co-re!” filled the concert venue. After some prolonged cheering, the members came back out onto the stage once more. They looked at each other and wondered what to perform and decided to go with Senbonzakura once again. 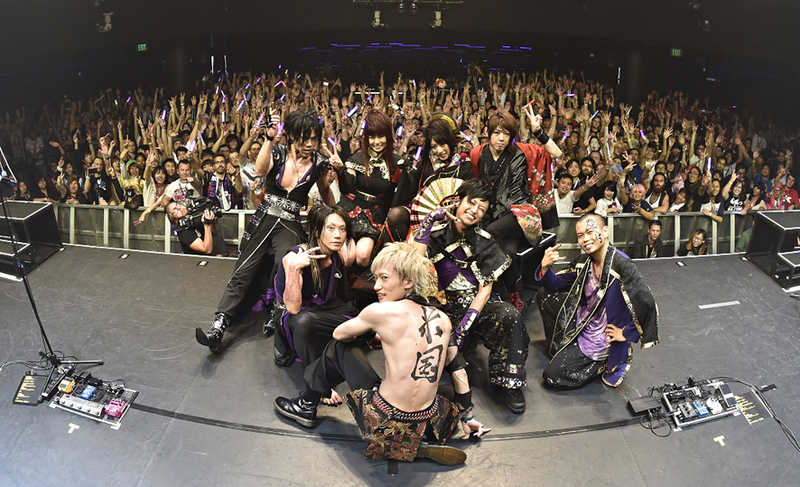 While seemingly repetitive, this was how Wagakki Band often ended their concerts. As the last notes from Senbonzakura died down, they took a bow together and then posed in front of the crowd, allowing a photographer to take a picture of them with the entire audience in the background. After the concert, the members held a Meet & Greet Event in the VIP lounge for VIP Balcony ticket holders. Fans got an opportunity to take pictures with the band and give them a high fives. 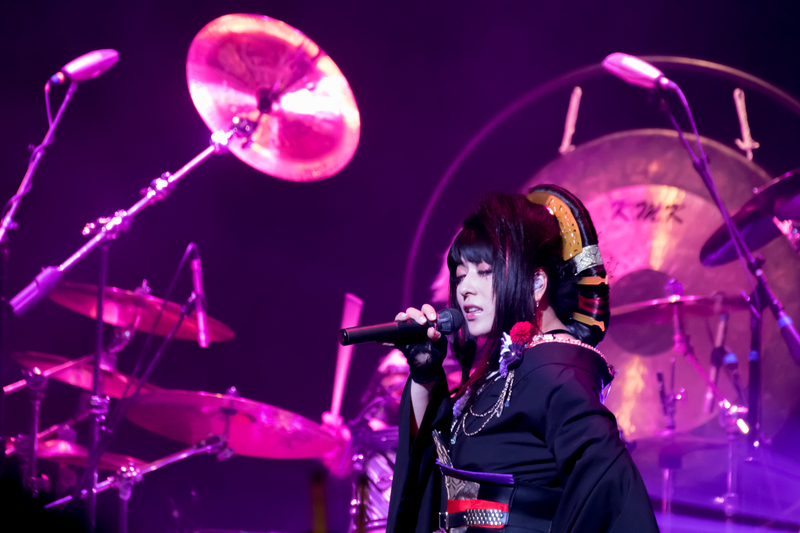 The pictures were then uploaded on the Wagakki Band Facebook page.